Federated Farmers is opposing the Western Bay of Plenty District Council’s moves to create buffer zones of up to 32 metres either side of electricity transmission lines. “Federated Farmers strongly opposes the creation of these Electricity Transmission Buffer Zones, because they are solely designed to protect transmission line companies’ interests and circumnavigate individual easement agreements with landowners,” Federated Farmers Bay of Plenty provincial president John Scrimgeour says. “Transpower says it wants these buffer zones to ensure safety and supply continuity. However, Federated Farmers feels the width of the zones is excessive, as is the level of proposed regulation around them. “We believe the resulting raft of new rules for earthworks, buildings and subdivision within those zones would hamper landowners’ ability to farm, without meeting Transpower’s original goals. . .
All New Zealand dairy farmers are better off because Synlait Milk and other independent dairy companies exist, says Synlait Milk Chief Executive John Penno. “While independent dairy companies make up a very small portion of the industry, the competitive pressure that Synlait Milk and others bring has brought about faster change within Fonterra than would have occurred had competition not emerged,” Penno said. Competition between New Zealand dairy companies is not about the international markets. It is all about competition for farmer’s milk. Because of competition, Fonterra pays farmers more for their milk, which forces independent dairy companies to develop their businesses faster to keep one step ahead, says Penno. . .
On February 9, delegates from the Swedish Parliamentary Committee on Environment and Agriculture were hosted by the New Zealand Farm Environment (NZFE) Trust on Gray and Marilyn Baldwin’s organic dairy farm near Putaruru. The Baldwins and their sharemilkers, Hamish and Jane Putt, were Supreme winners of the 2009 Waikato Ballance Farm Environment Awards. . .
My piece last week supporting the OIO decision on the Crafar farms deal provoked a lot of comment, most of it negative, but also, interestingly, it sparked a sometimes acrimonious debate between several respondents about the Israeli – Palestinian situation. Now that was something I didn’t expect, not considering myself to be remotely competent to cover that sort of global issue. Since my piece appeared I have picked up some really interesting columns by Fran O’Sullivan in the NZ Herald and Rod Oram in the Sunday Star Times which took diametrically opposing views on the same topic, O’Sullivan in support and Oram totally against. . .
Two Hawke’s Bay shearers will represent New Zealand at the world shearing championships, to be held during the Golden Shears in Masterton, later this month. It is an upset for David Fagan who was the favourite heading into the final shear-off, the Southern Shears, in Gore at the weekend. . . In an exclusive agreement, RD1 has committed to sponsoring the Dairy Women’s Network regional groups. The partnership is aimed at growing the reach and effectiveness of these groups over a three year period, helping to increase the success of women in dairying. RD1 CEO Sarah Kennedy, now a leading woman in the dairy industry, sees some direct correlations between the two organisations. “RD1 and the Dairy Women’s Network aspire to add value to dairy businesses. We also both have nationwide networks with a strong regional focus” says Kennedy. “The Dairy Women’s Network regional groups are not only the heart of that organisation, they are the grassroots of our industry, much like the RD1 store network. . . Dairy Women’s Network has announced its partnership with one of New Zealand’s largest and most respected industry training organisations, AgITO. The partnership was formed in an effort to open up further education possibilities for New Zealand dairying women. According to Mr Bryant, AgITO has a number of qualification options suitable for dairy women who are looking to further develop their careers or gain skills and knowledge in specific key areas from improving milk quality to business management and planning. . .
School milk was not one of the happy memories of my childhood. A half pint was too much for me to drink at a time and it was usually warm. Besides, like most of my contemporaries we had plenty of milk at home. Ample milk and adequate diets are no longer the norm for too many children and Fonterra CEO Theo Spierings has announced a plan to put it back in schools. Mr Spierings says New Zealand has the potential to be the dairy nutrition capital of the world, and this should start at home with Kiwis drinking milk. “When I took over this role I made a promise to take a fresh look at how we could make milk more accessible in New Zealand,” says Mr Spierings. Milk is an important building block for good nutrition. We want Kiwi kids to grow up drinking milk because it is good for them. We are looking to introduce a Fonterra Milk for Schools programme. We want all New Zealand primary school children to have access to dairy nutrition every school day. For some New Zealanders this initiative will bring back memories of the Government programme which operated in New Zealand primary schools between 1937 and 1967. We’ll ensure this time that the milk is cold and tastes great. The company is staring with a regional pilot for primary schools in Northland, covering 110 schools and 14,000 children, starting during the first term next year. It will be a voluntary programme for schools to opt into so we can get a fix on likely demand from schools for such a programme. “We don’t want kids having to drink warm milk in summer like the old days, so we will look at installing refrigerators in schools, and also explore options for recycling the milk packaging,” Mr Spierings says. Results from the Northland pilot will be monitored during the first three terms of the 2012 school year with the intention of progressing with a nationwide programme for the start of the new school year in 2013. Mr Spierings said Fonterra would welcome support from other partners for a nationwide programme, including the Government. As a supplier and shareholder in Fonterra I can see social, health, marketing and PR benefits from this scheme but it comes at a cost. The company announced an increase in the forecast payout this week and even without that expected returns this year were reasonable. But what happens when the price of milk, and therefore returns to farmers, go down? Once the provision of “free” milk is established it will be difficult to take it away again. I’m definitely not keen on the government getting involved in the provision of school milk, especially if it’s not being aimed at only those in genuine need. Its money would be better spent on initiatives which address the causes of ill-nourished children. The company has been criticised for the high price of milk on the domestic market and is continuing to review it. Our motivation is to have more New Zealanders drinking more milk because it is important for basic nutrition. To achieve this, we have to make it available and affordable. In recent years we have seen a major lift in international dairy prices which effectively doubled in 18 months. This has pushed up the cost of milk prices locally and we have seen consumption decline, with New Zealanders drinking less milk. Traditionally milk consumption in New Zealand has been increasing around 1-2 per cent per year but it is currently declining by a similar rate. “We are exploring a range of options to turn around the consumption decline by making milk more consistently affordable and will report back in the first quarter of next year,” Mr Spierings says. Fonterra will also trial milk sales in its RD1 rural supply stores. Anchor is our flagship brand and it makes sense to have it available in the 64 RD1 rural stores around New Zealand which we now own 100 per cent. “Initially we will be focusing on smaller towns that don’t have supermarkets nearby. From here we can measure the demand and decide whether to roll this out further,” Mr Spierings says. Customers of RD1 stores are predominantly farmers. But if the stores sell milk well below supermarket prices they will broaden their customer base and the competition will probably force supermarkets to reduce their mark-ups. It doesn’t surprise me that the Met Service is so popular. When you work outside and so much you do is affected by the weather forecasts are very important. I helped one of our staff set up a new laptop recently and he has the Met Service site as his homepage. Stuff includes most of the provinical papers and has good rural news and features. 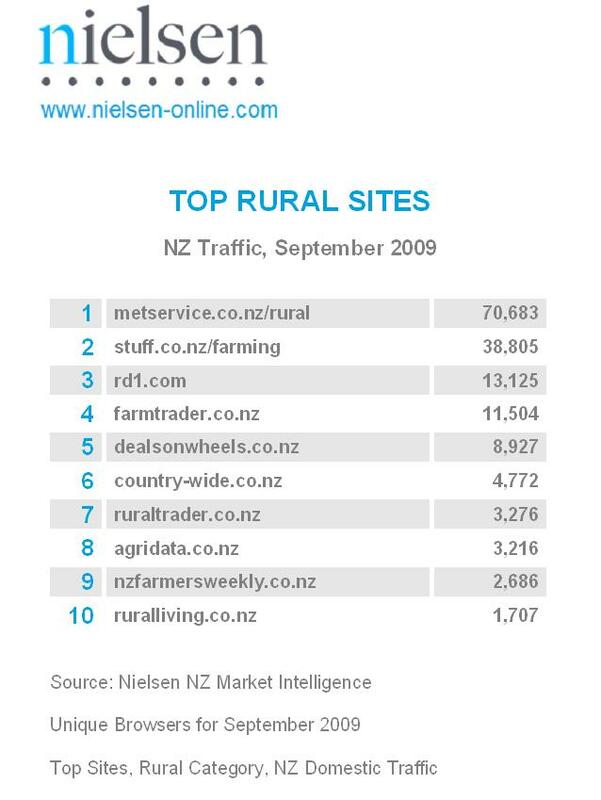 Countrywide and NZ Farmers Weekly are the most highly regarded of the give away papers which turn up in rural mail boxes. The popularity of the papers and dial up or slow broad band for internet conncetion might explain why their websites don’t get more hits.